Submitted by Liina Reimann on 07/01/2019 - 02:56. This weekend ESN Estonia gathered all together in Tallinn to celebrate our organisation and to show appreciation to our volunteers. 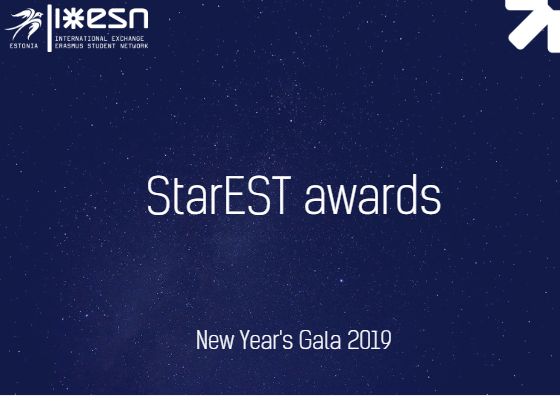 During New Year's Gala of ESN Estonia, we also had StarEST awards ceremony. Aim of the StarEST awards was to highlight amazing people, activities, events and sections. Our volunteers, alumni and Erasmus students had a chance to suggest nominees for all the categories. National Board together with National Council could pick winners for each category based on the nominations. Our sections achieved many things in the year 2018 and we are proud of them! This nomination was connected to an event, activity or a campaign, which aim aligns with Causes of ESN. This sector isn't explored much, but ESN Tallinn did best thing to make it prominent. Section organized LGBT+ meetup as they found it important to make the LGBT+ community students feel welcome in another country and make them feel at home. Aim of the event is to get the LGBT+ community people together and for them to help each other with their struggles and have support group in another country. In this category we were looking for a best practice, which other ESN sections could learn from. It could have been a campaign, communication method, event, project, tool to be shared with the rest of the network. We were looking for some valuable practices. Local Board Meetings was a new practice that came with a year 2018. All together we had 3 of them over the year. We believe it contributed ESN Estonia as a network the most. Sections feel more united to each other and to the National Level. This was a space, where local board members could get to know each other more, discuss important topics considering National level and help each other out by sharing best practices. This event was created in collaboration of National and Local Level. Together we are power – in this category we were looking for collaboration of 2 ESN sections. The cooperation that stands for working together, supporting each other in times of need, inspiring each other and forming cross-section friendships? Those two sections have organised many events together for the past year. They feel working with each other is easy, they share resources and help each other out in times of struggles. Sometimes it is difficult to differ, which section are the members part of, because they enjoy working together. But this event (spring and autumn edition) is something special they just must organise together. Event was created in 2017 by collaboration of two boards of the sections and has kept going as strongest section cooperation event. Event is about untraditional and fun sports, where every international student can participate in. In this category we were looking for a section, who helped out organising National Platform or a Training event. Great organisation of food, accommodation and the venue. Our National Training event was well taken care of by this section, as everything was very well organised. They took special care of every participant and made it very smooth for the content team. As Training events go, there are always many changes along the way. Sometimes they are last minute. This section manages to take care of all the small bumps in the road and organised a great event. Partners of ESN have been there to support our activities throughout the year. In this category we were looking for a cooperation between the section and either institutional partner (international office, university etc) or a commercial partner (any partner providing ESN discounts). This is a partner, who has collaborated with most of the sections in Tallinn this year. They help out with organising event, always support trying out new ideas and make sure everything is in line from the beginning till the end. It’s always a gift to work with like-minded people and receive such a big support from a Partner. This award was given out based on nominations of Erasmus students. In this category we were looking for the trip, which was well organised, gave students an opportunity to explore something new and created a great impression of a place. Something they would recommend to others. This trip is very well organised and gives you opportunity to explore Estonia in just 3 days! Trip goes through many Estonian cities like Haapsalu, Pärnu, Tartu, Võru, Narva. It gives opportunity to see a very different sides of Estonia. The tour guide is an expert on Estonia and shared a lot of interesting facts about Estonia. Erasmus students felt the care and love of the tour guide. Our network is full of stars and bright people, who volunteer to make sure international students in Estonia can make most out of their experience. They spend hours on organising events, activities and trips for the international students. Our volunteers know how to turn small ideas into great actions, how to stand for causes they believe in and how much impact they can have by helping fellow students. They are dedicated young people, creative and inspirational. Our volunteers are the heart of the organisation. In this section, there are nominations for great people - either remarkably devoted volunteers, heart-warming friends, hard-working young people. We are proud to let everyone know they exist! Newbie, who has shown true spirit of ESNer. They just joined, but they are extremely active. They join every event they can. They are exploring ESN network in every possible free moment. They are highly motivated, super excited to learn more about the network and everything connected to it. In this category we were looking for an active ESNer. Someone, who can always be seen on ESN events. They are either organising event or planning the next greatest new ESN event. They contribute to the network by being present and helping out. Merilin kas always been hardworking and active. She has helped with so many events. During the past year, she managed to be the event manager of ESN TU IC and vice-president of ESN Tallinn. She has always few volunteering projects ongoing, but she still manages to contribute her time to ESN. She has been active on local and on national level. She helped ESN Estonia with starting our blog this year. This is a true example of volunteering as a lifestyle and we couldn’t be prouder having her in our network. In this category we were looking for a person, who has devoted themselves for helping students. They know all the tricks and tips, when it comes to living in Estonia. They volunteer to make sure international students feels safe in their environment. They are the go-to person for every Erasmus student. Eliise is active on many levels. She helps with organising events, is part of TalTech board and always there to support National Level. When it comes to finding buddies for every student in TalTech, she has put a lot of effort in it. She gives all the Erasmus students warmest welcome, she has good tips and tricks for them as well. Eliise herself has biggest amount of students as a buddy. You are never in trouble when you have a person like that helping you out! In this category we were looking for inspiring person in our network. That person has knowledge, devotes their time on helping other ESN people around them and also never misses opportunity to help out with the events. This person has left their impact and influenced ESN network in Estonia. Sandra is an inspirational person in ESN Estonia’s network. She is ESN TalTech president, National Training Coordinator and actively participating in international events (AGM Costa Brava, NEP Jelgava and Eduk8 Autumn Training). She won’t turn down a challenge and always finds new ways to improve herself. She makes sure that her section is well-represented in numbers, when it comes to ESN Estonia events. Sandra is organising events herself and gives a great support to her members. She has contributed a lot to strengthen her section and thanks to it ESN TalTech has made a big turnover past year. She is a President of ESN Tartu, who is devoted to make her section shine. She never misses an opportunity to help, organize an event or representing her section on National/International event. She has said that organizing is an addiction, and she can't get rid of it so that should say a lot about her already. There is no excuses when it comes to Relika – if no one else can do it, she will.She always gives constructive feedback to make sure members can improve their skills and is there to lend a hand either during the event or planning it. We also believe thanks for her contribution ESN Tartu has improved become closer with Tallinn sections and National level. Erasmus Student Network Estonia (ESN Estonia) is a non-profit international student organisation. Our mission is to represent international students, thus provide opportunities for cultural understanding and self-development under the principle of Students Helping Students.